I've wanted, for a while, to try my hand on writing a longer work for a fountain pen. I originally planned to write a review rather than an overview for the Conid. Instead, I ended up writing a bulk of this on a lazy Sunday morning so I've decided to leave the review for later down the line. I did not take any care in editing this so please excuse any grammatical errors. My personal allure to the Conid pens lies in the filling system and ergonomics. The Conid model that I found most fitting to my preference was the Minimalistica. 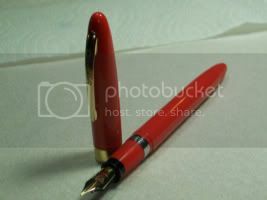 My main fascination with the pen was the uninterrupted physique of the pen body. No threads on the body: count me in! At that point in time, the filling system was a nice additional to the pen that I found to be just interesting. I took a leap of faith buying the Conid pen. I didn't have any idea what the pen was going to be like. After my extended experience with the Minimalistica, I found the pen to be quite worthwhile. There isn't any instruction of any sort with the use of the spare o-rings. I can tell that one goes on the cap and another goes on the rod. Not sure on the third middle-sized one; I did look over the tutorials on Conid's site but I did not see any use for it. The pen comes with a stealth pen styling: black with titanium trim. I like that the pen does not warrant any unwanted attention - very suitable for a daily workhorse. I don't connect with the pen personally... It is a pen that says: time to get to work! There is a beauty in that; I don't get distracted by the beauty of the pen. Conid allows for some deviation from their slotted style. I asked for a few changes: cigar-shaped body, initials on the clip, and removal of the cap finial. I was able to secure my suggestions barring the cigar-shaped body. I wondered if it was because the cigar-shaped Minimalistica was only made for their special edition - I never did ask. The laser-engraved initials came as complementary, rather than at an additional cost. Admittedly, I later decided to cancel adding my initials to the clip. It came as a surprise that the pen came with my initials on it. It didn't really matter to me, but it leaves communication on the mind for possible future purchases with Conid. To my untrained knowledge, I can't speak much technical opinions on the pen. I can only go by how it feels and how it has aged in the time I have had the pen. The material that I chose for the pen is the Delrin model. Originally I found the material to feel a bit slippery compared to the Sailor plastic I was used to. Over time I found no real issue with gripping the pen. I'm not certain if it is psychological to me or physical to the pen, but I did find the grip to be less slippery over time. The pen feels substantial. There is a denseness to the pen that gives the impression of a very solid pen. There are only a few minor aesthetic flaws that came with the shipped pen. "2- Minimalistica : conical shaped grip medium diameter 11.2mm , front diameter 10.3mm diameter12.5mm at 20mm from front of section." The main ergonomic appeal to me is the lack of threads on the body. 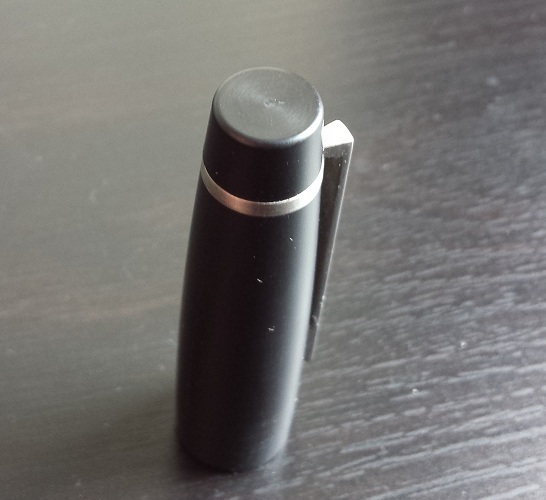 Since the pen cap is done with an o-ring, there are no threads or clutch on the pen body. That leads me to my second point. The pen is excellent in the hand uncapped. The uncapped length, weight, and balance of the pen works for my hand quite well. The pen feels solid in the hand: it just feels right like a nice fitted glove. To give a comparison, for a pen of a similar length of the Minimalistica, perhaps a tiny bit shorter, I would usually prefer to post the pen. A pen like a Montblanc 146 or a Sailor 1911. I think, for one, the Conid is a bit longer as well as a bit more back heavy which is why I prefer the ergonomics of the Minimalistica rather than a similar pen shape. I have really never used the pen posted, so I have not much comments. The posting does occur on the o-ring of the cap on the knob of the body. Perhaps a deeper posting on the body would be more ideal. The unposted version is more than enough for me however! 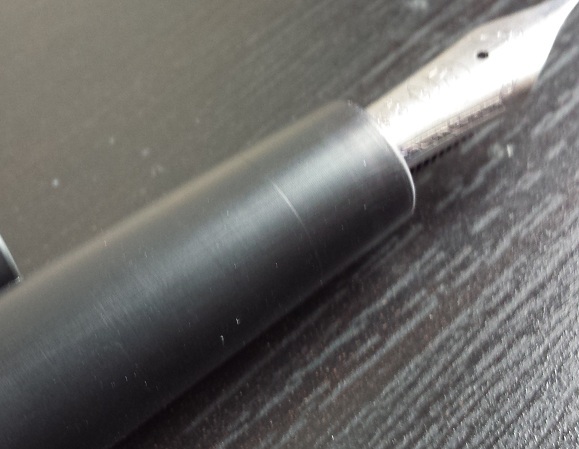 The gripping section of the pen, if you can call it that, is what I find ideal: not too thick and not too slim. I'm not going to go into too much technical detail since other reviews list the details much better than I could. I will say that the filling system is easy to use: easy to fill, easy to clean, and easy to use when you want to refill the reservoir. Just a complete filling system I feel. I don't have any real issue with refilling the reservoir or opening the seal for longer writing sessions. It is a process that comes as a ritual to the pen. For longer writing, the knob is unscrewed and pulled out some length. There is some play with the rod when the knob is unscrewed and extended. This is noticeable at times during writing. Really not noticeable to me, but could be for hard-handed writers perhaps. It's more or less just the tapping motion where you notice the play. The sidestrokes and such: you don't notice the play at all. There is no ink-window with this delrin model. You can hear the ink sploshing inside the body, and can somewhat tell when the ink is running low. This does take some getting used to. I purchased the companion tooling for disassembly. I've only taken apart the pen once out of curiosity. Personally, I would prefer a longer knob rather than the short stubby one the pen current has. For refilling with the Visconti Inkwell, I would have to empty the pen out without creating the seal. If you try to empty with the seal entact, a lot of pressure builds up inside the inkwell. As you may guess, some ink spews out. Filling the pen is easy enough but I'd have to turn the knob pretty quick after I pull the knob all the way down. The knob wants to move up for whatever reason after I fill the pen. 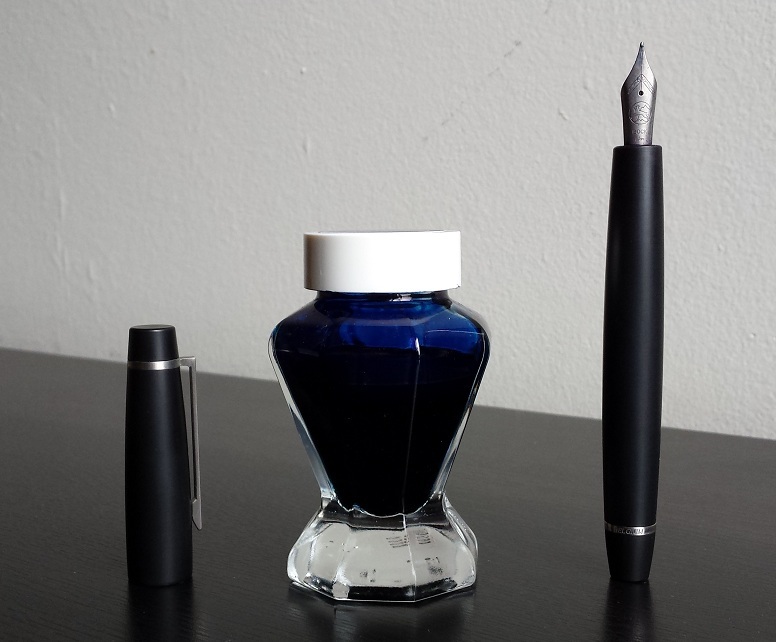 A fuller fill is easier on the Visconti Inkwell, but I'd imagine a 2-fill for the Conid would create the same result. Although it is more troublesome if you have the delrin model instead of the transparent. The pen caps on with an o-ring secured inside the pen cap. I've found no real issue with the o-ring system. Even if the seal becomes too loose, one can replace the o-ring easily. The o-ring leaves a faint marking - which isn't deep, just a tattoo'ing - on the body of the pen. There is some play to the cap with the o-ring capping system. This isn't not a real issue because the pen is very securely attached. There is a machined inner cap inside the pen. I have not encountered any drying out of the nib thus far. There is a hole on the cap that does what it needs to do. It is stealthily hidden under the clip. The clip works I suppose? Personally, I just bought the clip version of the pen just so that cap wouldn't roll around. I've never used any pen clip for actually clipping. Originally I bought the pen to fit my Sailor nibs on the pen. I later find that Sailor nibs don't fit perfectly on the Bock feed - I encountered a saturated feed when refilling the seconday reservoir. I relucantly went back to the steel medium nib that I bought with the pen originally. I later did find that the feed had a slight chip that may have caused the saturated feed. I have moved to a standard Bock feed in the meantime - of which I haven't encountered any saturated feed. The steel medium nib is a dry writer. It writes smoothly, and without much feedback. I don't use this steel nib anymore: I now favor the Titanium Bock nib. I prefer a nib that is on the wet end and writes with more feedback. One point to note about the nib unit is that they are modified by Conid. The plastic bit that is usually there for the converter is drilled off; There is also a metal tube attached to the feed as well. Another point is that it is a bit confusing to buying additional nibs after buying the pen. You go through the same process as buying the pen but move the quantity of the pen to 0. 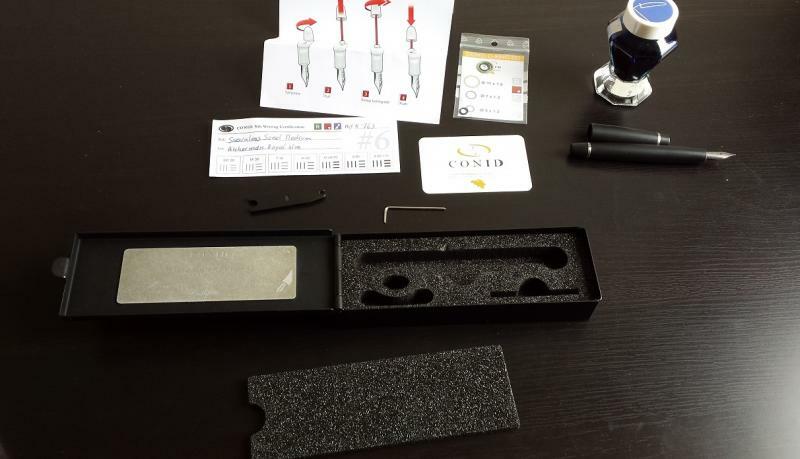 I think that there should be a separate tab on the Conid website for accessories such as tooling, nibs, and maybe even the Conid pen stand that comes with the special editions. The Bock Titanium nib I have on the pen current wasn't purchased from Conid, so I don't think it is much to talk about. I do the enjoy the nib a lot more after I got it adjusted by Mark Bacas. I do not think about attempting to get a Sailor nib on the Conid anymore, the adjusted Titanium nib is a pure joy to write with. The Minimalistica isn't cheap. It is a serious investment in a pen that I've made only a few times. But this was the only time where my satisfaction was at its highest. No real complaints for the pen that weren't fixed - just the nib problem initially. Where does the cost come from? From my perspective and reading of the web, the materials are all excellent and the pen is made with a tight tolerance. I don't really understand the second point as much, but I'll take the many people who mentioned it to be right. The filling system is another part of it of course. What pens uses the Bulkfiller? Just the Conid models. The filling system is great to use from a user perspective. The single Steel nib that I bought initially was disappointing. There are plenty of options for attaching vintage nibs or other Bock nibs. So there is no real issue with having a good writing experience. Communication is a good point to bring up. I don't think Conid's communication is great. My impression is that it is all managed by Werner - who I believe is plenty busy with other work. Really, communication is the greatest weakpoint of this pen. If you order the pen and don't want to change your order later on, the communication is just fine - just slow. But if you want to change your order, and add more bells and whistles to the pen, that is where I would suggest thinking it over carefully before submitting your order. The Minimalistica is a solid overall package of a pen. Cool review of an often too overlooked model. Thanks for the review. I agree about the communication. Could be better for sure. However, my guess is that they are very busy and perhaps under staffed. So I can understand the delay. My new Conid Reg-Bulk is scheduled to arrive Monday. It will be my second. I plan to buy a third. Great review! I must say all the Conids look great! I would suggest buying a few different nibs. I personally like the Titanium more than the Steel by a pretty large margin. No comment on the Gold, or any of the other Bock nibs (Palladium, Platinum). Hopefully communication improves over time. Perhaps add a staff for dealing with emails and customer service. If Conid ever comes out with more colors for the Minimalistica, I would be hard-pressed not to buy one. But it seems so far that the limited editions are for the higher end models (regular, kingsize) unfortunately. I agree but there could be more variety in color for sure! Would you say this or the regular for the first conid? I'm thinking of getting this in the demo or the regular demo. I don't have a Minimalistica, but I do have two regular Conids. Get a regular. I bought this on the first production run with the Titanium Extra Fine nib. This is truly a great pen and well worth the money. I have no experience with the regular so I can't speak about suggesting it. I don't think you can go wrong with either choice. I wouldn't describe communication as a weak point of a pen. Similarly, ordering details are not properly part of the pen. Of course, both may be useful information to the reader, but they are separate matters. Yes, I think that is a fair opinion to have. I would say that communication is worth more weight in a case for Conid because every pen is made to order rather than sold at different online retailers. It's very much like ordering a custom pen where communication is essential - but of course, Conid is not a full custom pen maker. My regular streamlined has now arrived. When (if) I buy a third, it will be a regular. I REALLY like this regular. I may even sell the minimalistic to buy another regular (any buyers? ). As far as the nibs: my first experience with the Titanium was not so good. I accidentally sprung it within two days of owning. They're very sensitive and you can't press down with much pressure at all (I found out). Also, The feed didn't seem to keep up with the flow the way I like it. However, when I ordered the gold nib for it, the difference between the gold and titanium was night and day. The feed allowed more ink, and gold nib is just a smoother better writing experience IMO. The cost of the gold makes it tough on the buyer who has already spent over 400.00 on the pen alone, but I'll never buy another nib other than the gold again. The gold nib ROCKS! My new one (the regular) came with the 14kt gold Bock. The gold nib I ordered for the minimalistica was the Conid 18 kt. Both are medium stubbed. They both flow very well. So that's my experience in a nutshell. "Really, communication is the greatest weakpoint of this pen." Communication is absolutely not a part of the pen and has absolutely nothing to do with evaluating the quality of the pen. Even if one communicates a special request for some custom aspect of the pen and that request is not satisfied, and that does not appear to be the case here, the quality of the pen can still be determined independently of such failures in communication. I have no experience with the gold Bock nibs, but I find that I may be too annoyed with the contrast with the Titanium trim of the pen - even if the nib is rhodiumated. Glad to hear that you found a nice flowing nib for your pen. I agree with your point now that I thought about it more. A pen should be evaluated based just on the final product rather than other external elements such as communication and ordering. I would also like to append a correction on the piston knob for longer writing. I found that I pulled the piston knob out too much which caused the play with the rod. With the correct 2mm outwards, this is not an issue. Ergonomically, I have leant towards preferring the Minimalistica to be a bit thicker and longer uncapped. Still, the pen is rather good in hand but a small change in the size would make it perfect for me. I have this pen and hesitated greatly to write negative comments because the Conid folks tried so valiantly to correct problems. But the facts won out. To begin, I'd like to say that the workmanship is superb and the steel nib was one of the smoothest out of the box nibs I've ever experienced. But, unfortunately, there were problems. First the section area leaked. To the best of my knowledge there was a micro-crack in the Delrin. Conid repaired the leak. Second, my hand cramped because the slippery Delrin body necessitated a tight grip. So the fine people at Conid sent me a clear acrylic body which totally fixed that issue. I'd like to add that the transparent body made filling much easier, because you can see what's happening at each step in the filling procedure. 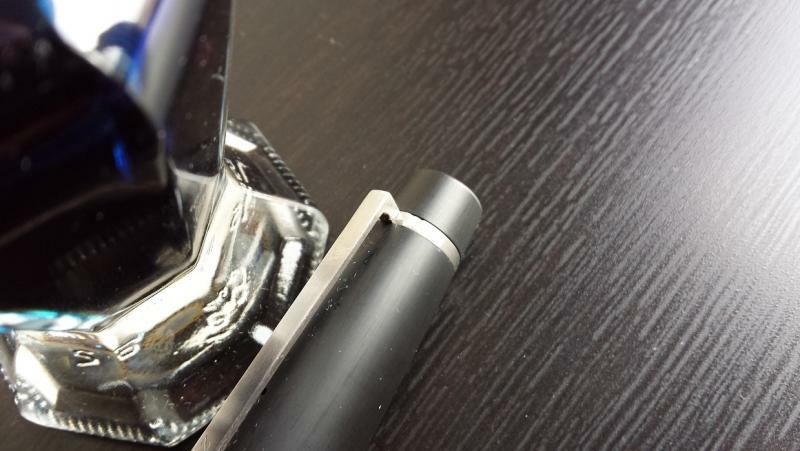 Third and last, the thin central tube, which delivers the ink from the reservoir to the nib, became empty causing the pen to stop writing with full reservoir. Conid could not tell me how to fix this other than to re-fill the pen. I did refill it, but the same thing happened again on the very next filling. So, I'm sad to report that this beautifully made pen is now sitting in a box, un-used. Edited by Precise, 01 September 2018 - 17:22. 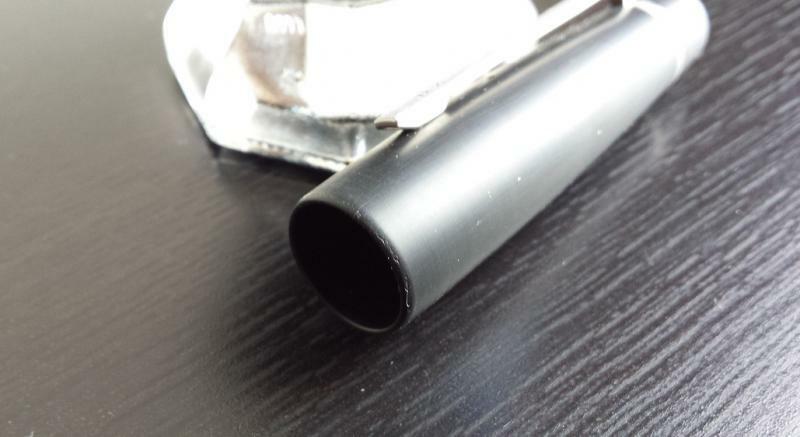 Third and last, the thin central tube, which delivers the ink from the reservoir to the nib, drained empty causing the pen to stop writing with full reservoir. Conid could not tell me how to fix this other than to re-fill the pen. I did refill it, but the same thing happened again on the very next filling. This with the piston cap unscrewed 2mm? To add. Not to deny your experience with the Delrin, but to state mine. I find that when I balance the Minimalistica in hand, the pen writes with the lightest touch. I write forefinger up, three quarters of an inch from the tip of the barrel. Edited by Karmachanic, 01 September 2018 - 07:17. Piston was not unscrewed. Conid did not recommend that.